Don’t forget to check out the other kids and adult coloring we have on the site – including our gorgeous eColoring Book (24 pages) which costs a price of a coffee, and every sale donates to mental health charity! We are a strong believer on KiddyCharts that relaxing together is something that kids and parents need to do, and should dedicate a little time to whenever they can. This is why we are starting a series of mindful coloring pictures for both adults and kids to work on side by side. Our first theme combines a cat adult coloring page with a kids cat coloring page in a brand new design from Hattifant. As always these are stunning pictures, and your kids will be charmed both by the cat, and the kitten to color. 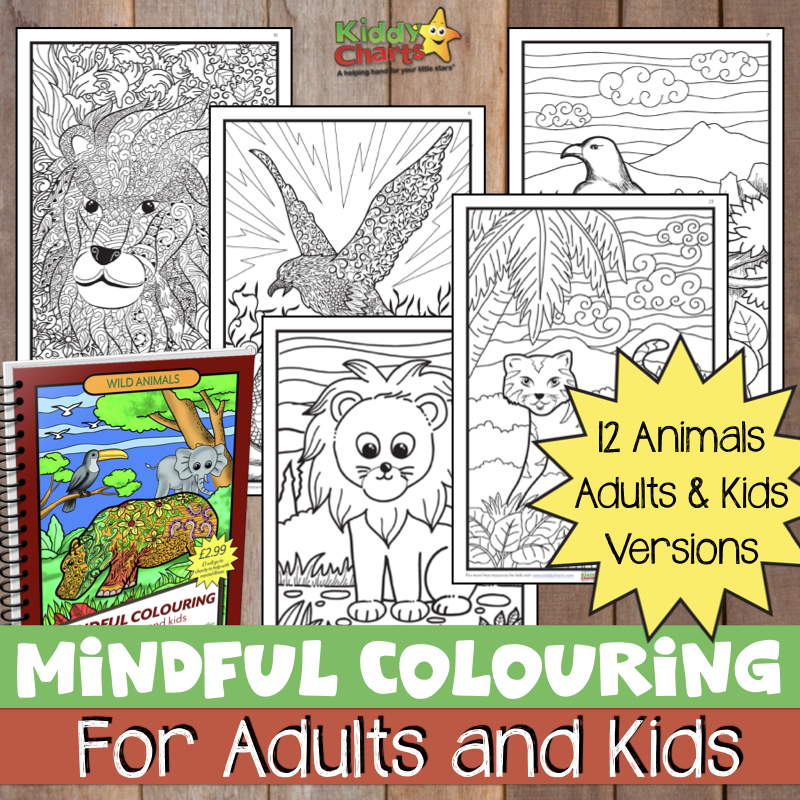 Why not download them now so that you have something for your next mindful session with the kids? 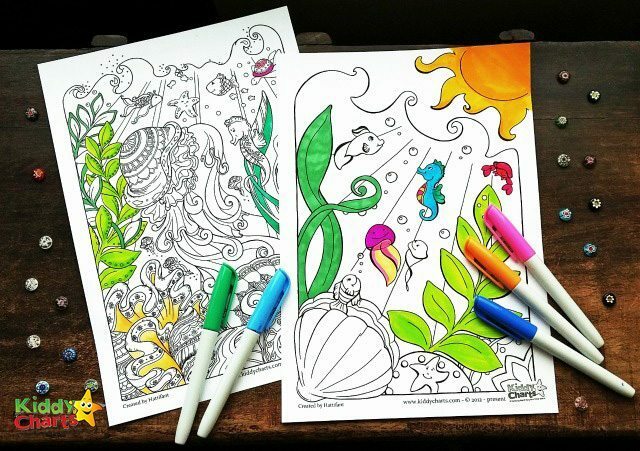 And yes, kids can be mindful too – it only takes ten minutes a day and coloring is a perfect way of relaxing so that you really can forget about and accept everything around you. Even all those emotions that usually get in the way of you relaxing. I am sure you would agree that this picture is perfect with just enough detail to make it a little harder for an adult, or an older child. My ten-year old can’t wait to get her hands on it…. Even better there are a couple of little hidden additions within the page; a fish and two birds. Can your little ones spot them? For the kids mindful coloring picture, we have gone for a little less detail around the cat/kitten, but the same free cat, which means the kids can use their imagination to color in the shape, or leave it if they choose. Either way, it makes for a lovely picture. If you like this, why not follow the blog, so you don’t miss the next one in the series, or any of the other free printables we produce regularly on the KiddyCharts site. You will love this one. It is ocean themed and the kids version is little less detailed, so they can join the fun. A booklet of travel coloring for adults to get you in the mood for moving! What Mommy Does‘ collection of resources for adult coloring too. We hope you love these pages, and do share them on Twitter, Facebook and Pinterest if you do so we can spread the love. Why not join our mailing list as well? If you love this – you will love our kids and adult mindful coloring book, so go check it! Every copy sold for the price of a coffee includes a £1 or $1 donation to mental health charities. Can I use these coloring pages for a project where we donate materials to libraries all over? Hi there. Can you drop me an email please to explain a little more? [email protected] Thanks. Hello, may I ask what kinds of pencils, pens or markers you use? The colors in the adult cat pic are beautiful. I’m fairly new to adult coloring so I still haven’t figured out which are the best supplies. Thank you! This was actually taken by the artist, so I am not too sure – let me check for you! May I share the two free cat pages with my library group. I will give you credit and link to these pages.